If the ocean’s limitlessness is personified in that well-worn geography class fact that it covers 71% of the earth, well, that means that an awful lot of underwater enchantment lurks just below its surface. 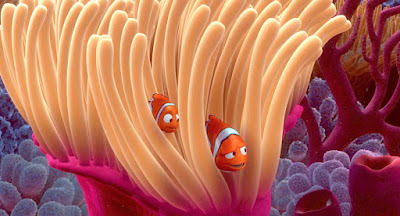 And in “Finding Nemo” director Andrew Stanton and his visual effects teams revel in so much of it, from strikingly rendered anemones to the sunlight glistening through the water, all rendered to inspire a whimsical “Sigh…..” But all this animated movie glory merely underscores my favorite images in the movie, those not set down there in the Pacific, but up there in Australia – Sydney, to be exact, inside a small aquarium that is inside a dentist’s office. That aquarium is where the titular Nemo (voiced by Alexander Gould), the little clownfish of the title, afflicted with a wounded fin, winds up after he tries to prove to his neurotic single dad Marlin (voiced by Albert Brooks at his most “the boldest experiment in advertising”) that he’s big enough to swim off by himself into the vast ocean only to get plucked up by a diver at surface level in a boat who ferries him away to live in that aforementioned tank. This forces Marlin to find Nemo, a Hero’s Journey as carried out by a Father for whom the Elixir will prove merely to be his own son’s safety, and which brings dad into contact with so many magical characters. Like Dory, the regal tang voiced by Ellen DeGeneres who gets her own movie this week, and who suffers from short term memory loss, Leonard Shelby style, but which the movie treats with storybook innocence, and just a skosh of wistfulness, rather than “Memento-ish” guilt. She seems more in line with the movie’s gaggle of gnarly sea turtles, 150 years old, who turn up later on the East Australian Current, speak in surfer-style slang which is apropos because they seem have figured out the key to life is slowing down even when you’re moving so fast. 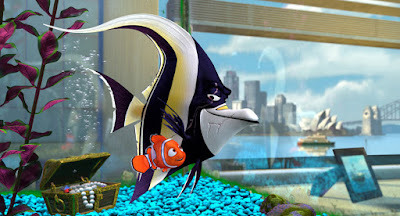 I loved them all, and I loved the seagulls, a side-splittingly accurate portrayal of those dastardly beasts, but mostly I loved Gill, the Moorish Idol with a scar, unwillingly sentenced to life of monotonous non-labor in that dentist office aquarium. Gill is voiced by Willem Dafoe and his voice is based, the actor has said, on the character he played in “Animal Factory”, Steve Buscemi’s 2000 San Quentin-set drama where Dafoe’s lifelong con, Red Redding with a real edge, mentors a newbie in prison. Dafoe’s Gill isn’t quite that hard, of course, and besides, you can just as easily detect fumes of idealistic glimmer akin to his Sgt. Elias in “Platoon.” He draws on his vast experiences as an actor to mount a vocal performance of weary restraint that is comically moving and movingly comical. His voice is complimented impeccably by backdrop. There are few shots I’ve loved in any recent movie I’ve seen more than of this semi-sizable fish tank imprisoning Gill and Nemo, and several others too, set in the most terrifying venue of childhood with a window positioned off to the side and in the background that peers upon the most spectacular 21 mile swath the Earth can claim – Port Jackson, or Sydney Harbour, with the staggeringly opulent opera house looming on the opposite shore, those striking blue waters teasing, tantalizing, falsely beckoning. What, I ask, could be more tragic than this juxtaposition of this glass-sided tank and its artificialized seascape and the most marvelous natural watery splendor? It sounds sullen, I suppose, putting what is fundamentally a kids movie in “Finding Nemo” in the context of an morose incarcerated Moorish Idol. But it’s not simply that “Finding Nemo” is one of those Kids Movies For Adults. No, it’s an Adult Movie Seen Through The Eyes Of A Kid. I’ve been thinking about this in relation to John Hughes’s “Ferris Bueller’s Day Off”, that icona-pop classic that turned thirty years old this month. I’ve been thinking about it because there is a curious tendency for so many critics to apply –isms – be it classism, escapism, realism, even Reaganism – to a movie whose titular character openly derides –isms. Now he doesn’t deride them because the movie is anti-intellectual; he derides them because he’s a teenager and most teenagers are more into posters on their wall of John Lennon quotes than –isms. And that need to apply –isms to a movie that deliberately seeks to hurl them out the window to go for a joy ride instead speaks to a recurring problem of people who can’t remember what it was like to be a certain age. Hughes is inviting us to view the world through the eyes of Ferris Bueller, but a lot of people seem oddly more determined to see it through the eyes of Ben Stein’s Economics Teacher, wondering what this monologue on the Smoot Hawley Tariff Act really means. It might suggest that “Ferris Bueller” would have been smart to present its adult characters more well-roundedly as opposed to as arch-villains or clueless enablers, and while one could easily argue that Edward R. Rooney, Dean of Students, has right on his side, you could also argue that he refuses to see the world through the eyes of Ferris. There is, I have long suspected, an alternate ending to Ferris Bueller, where the titular character piles back into a sweet ride with his sister Jeanie and Rooney, and they roll down Michigan Avenue and drink virgin daiquiris in the Signature Room. Gill’s got a little Edward R. Rooney in him. He’s not gonna try to make a break from the aquarium again cuz he knows to do so means his cheese will just get left out in the wind. But, little Nemo gives him a spark, allows him to see the world through the eyes of a little blowfish. So he makes it his mission to get Nemo out of there, and if Gill is never going to become as go with the flow as those delightful turtles, well, he still gets a little vim back in his swim. Yet that’s also what makes the film’s tag so drastic. I mean, it’s an amusing moment, sure, and I laughed when I saw it, but the further I got from it, and the more I considered it, the more it left me stricken. It’s a beautiful thing to see the world through the eyes of a child, until you realize it’s merely a view down a blind alley.